Through the decay and debris of a crumbling infrastructure, chasing the championship parade that never marches, the New York Knicks' recruitment to retain Carmelo Anthony comes with the promise to pursue Kevin Love into the franchise's 2015 salary-cap space. LeBron James comes free too soon (2014), Kevin Durant too late (2016), and the best, biggest star available to New York has been validating management's wanderlust with an MVP-esque start to the Minnesota Timberwolves' season. 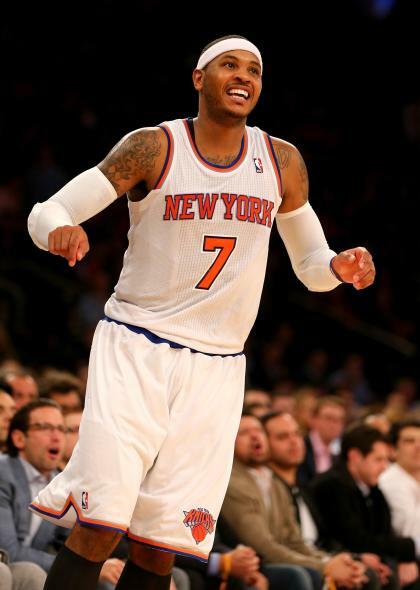 In a lot of ways, the Knicks are pursuing the illusion of a title with Anthony as their centerpiece. Nevertheless, they're unwavering in turning the franchise over to him. The plan had been a three-year window to chase a championship, but it turned into one season – if it was ever that a year ago. New York is pushing toward a fresh scapegoat, coach Mike Woodson, but the Knicks are a combustible blend whose struggles have far less to do with their coaching and far more to do with lousy ownership. New York is back where it started with 'Melo in 2011, framing a future for him that looks so much better than the present. To re-sign Anthony upon his contract opt-out in July, the Knicks count upon the fact that they can still give him three things no one else can: a five-year, nearly $130 million extension; the bright lights of the Madison Square Garden marquee; and an expedited retooling plan. Almost assuredly, Love will exercise his early termination option in two years and take a strong look at where the free-agent landscape stands with the T'wolves. He could re-sign a longer, richer deal with Minnesota, or chase big-market platforms in New York, Los Angeles, Chicago and perhaps elsewhere. The Knicks are buried in salary-cap hell through 2014, awaiting Amar'e Stoudemire ($23.4 million), Tyson Chandler ($14.3 million) and Andrea Bargnani ($12 million) to expire. The Knicks are sold on Love in 2015, sources tell Yahoo Sports, and they've already begun devising a strategy to lure him when the time comes. The possibility of leaving the Knicks for the Los Angeles Lakers will be Melo's leverage until it no longer is, but as one source with knowledge of the process says: "Do you think 'Melo wants to be known for not winning titles in New York and L.A.?" There are beloved ex-Knicks who never win titles – Patrick Ewing, John Starks, Larry Johnson – but those players don't exist in Lakers lore. If winning is an obsession to Anthony, let's be honest: He would've stayed in better shape, been a better leader and teammate in his career. Anthony would've used his organizational muscle to spare the franchise's wasting of a roster spot for J.R. Smith's younger brother as part of a sweetener to re-sign the NBA's Sixth Man of the Year. Everyone wants to blame Creative Arts Agency for the packaging of the players, but Chris Smith, associated with a different agency two years ago, had been granted a guaranteed contract with the Knicks for the 2011-12 season. Only, Smith blew out his knee and received his $490,000 on the injured list. This was a stooge deal on New York's behalf, an embarrassment afforded a player, J.R. Smith, who doesn't deserve this kind of treatment. "Glen Grunwald never wanted to do it, never felt right about it back then," one source with knowledge of the package deal said. "That call came from above him." Within the Knicks coaching staff, they believe Chris Smith doesn't even have the talent to be an NBA Development League player – never mind worthy of a roster spot. One opposing GM called him "maybe the worst player in the history of the [NBA] summer league." Perhaps that's harsh, but the Knicks need to sign a big man in the wake of Tyson Chandler's fractured leg, and Chris Smith's roster spot creates an obstacle. In the end, the Knicks give Anthony everything he wants, including the recent hiring of his personal trainer, Idan Ravin. There is a complete disconnect between Ravin and the Knicks' coaching staff, who have little use for him, sources said. Still, the Knicks coaches understand: From a wasted roster spot to a highly paid personal trainer who can act independently of the coaching staff's wishes, ownership makes it hard for good players to want to leave. And truth be told, ownership makes it hard to coach good players in New York. Take a look at model franchises in San Antonio, Miami and Indiana, and you'll see: This all makes winning harder, not easier. Now, owner James Dolan has turned over the Knicks to Steve Mills as president and general manager. Only in the Knicks' parallel universe can an executive help run the franchise into the ground for a decade with Isiah Thomas, get fired, move into the financial sector, chase the National Basketball Players Association's top job and then, somehow, get his old job back – this time with more power. The Knicks can afford to pursue the best basketball minds on the planet, and yet they recycle top executives with failed, unaccomplished or untested histories. Donnie Walsh and Grunwald had been exceptions, and yet ultimately they were run out of the GM job. This is why the Knicks are unable to build something sustainable, why they're forever chasing salary-cap space, chasing stars, chasing the illusion of contention. 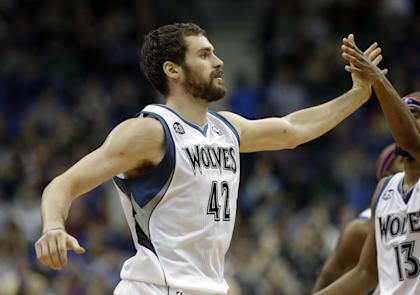 Kevin Love is on deck to be recruited to New York in 2015, and that's among the reasons the Timberwolves are so determined to make deals to climb deep into the playoffs these next two years. Young Minnesota players Derrick Williams and Alexey Shved are available in deals for veterans to help these T'wolves now, league executives told Yahoo Sports. The suitors promise to be plentiful for Love in two years, which is why the Knicks are already brainstorming his pursuit, sources said. Between now and July free agency, the Love pursuit will be part of New York's hard sell to Anthony. The Knicks are a mess now, but the mirage never changes: always a salvation on the way at the Garden, always a championship parade headed down the Canyon of Heroes. With the Knicks able to pay $30 million more than everyone else on the market, with the Knicks affording him and his inner circle a full run of the Garden, make no mistake: Carmelo Anthony will want badly to believe them. Again.